Check out destin beach houses at seaside beach, or stay at Vacation resort hotels in Florida, on your destin florida vacation. This is a neat beach that always seems to have interesting community events happening. Seaside is planned for pedestrians, and folks on bicycles. Plan your destin vacations here, and see seaside rentals florida. Seaside, Watercolors, and Seagrove Beach sort of run together, and it is hard to tell where one beach ends, and the other begins. These beaches are around 20 miles from destin. Stay at Resort Hotels in Seaside Florida. Seaside is the sixth of the beaches of south walton. It is a planned community, and is famous locally as the location of the movie, The Truman Show. It is designed to be friendly to pedestrians and cyclists. There are several trendy shops and neat restaurants, right on the beach. 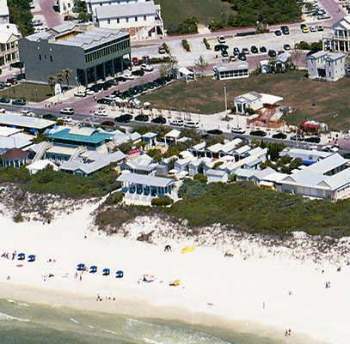 Check out destin beach houses at seaside beach, one of the beaches of south walton county. Seaside is located on county road C-30A, south walton's beach route. All of the walton county beaches are strung out along this road like a string of pearls. One of south waltons great bike paths runs alongside this road. Seaside was designed to resemble a new england fishing village, and it is a neat and friendly place to visit. It is laid out to be very pedestrian friendly. It is very compact and you can walk to just about anywhere you would want to go. The restaurants and shops are very laid back, and you can go about anywhere in your beach at tire. Seaside adjoins seagrove beach to the east, and watercolor beach to the west. There is a neat bike path that connects all of the beaches of south walton that lie along county road 30 A. The bike path is well off the road, and you can ride with your small children without having to worry much about traffic. There are no resort hotels in seaside proper, but the watercolor resort is just next door, and it does feature a hotel and inn on the beach. The watercolor resort is within walking distance of seaside, so where ever you stay both resorts are close together. You can check our statewide hotel link below for hotel rental information in the destin area.